3 point sling: I started using the Wildnerness Giles sling around 1997. The advantages of this sling is that it does a good job at retaining the rifle when transitioning to the pistol. You can drop the rifle and it will generally go diagionally across the body. With the sling in the slung position it is fairly easy to walk, you can push the gun to the side or around to your back side when kneeling down, climbing a fence, or performing simular tasks. 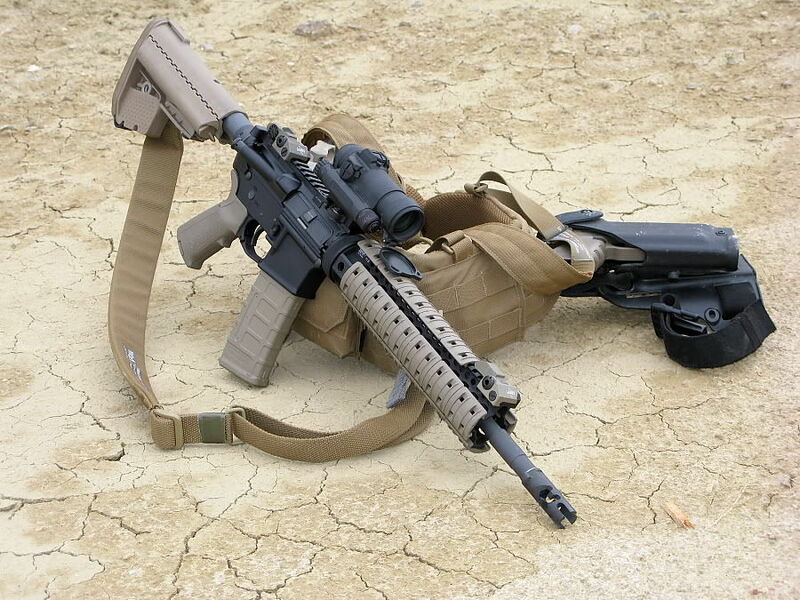 The down sides to 3 point slings is the sling is restrictive and can get in the way on the AR15 weapon system. For a right handed shooter the strap can often interfer with operation of the charging handle and the bolt release. I have seen a 3 point sling interfer with a mag change during training as well. For a left handed shooter part of the sling has the potential of interfering with the ejection port. While the 3 point sling does a good job at retaining the rifle close to the body and restricting the rifle from excessive movement I have found that a 3 point can easily get hung up on gear that is being worn (vest, load bearing equipment, etc). Transitioning from strong side shoulder to support size shoulder or vise versa is next to impossible with the 3 point sling designs. Single Point sling: I started using a single point sling around 2002. With a single point sling I felt like I had a lot more freedom. 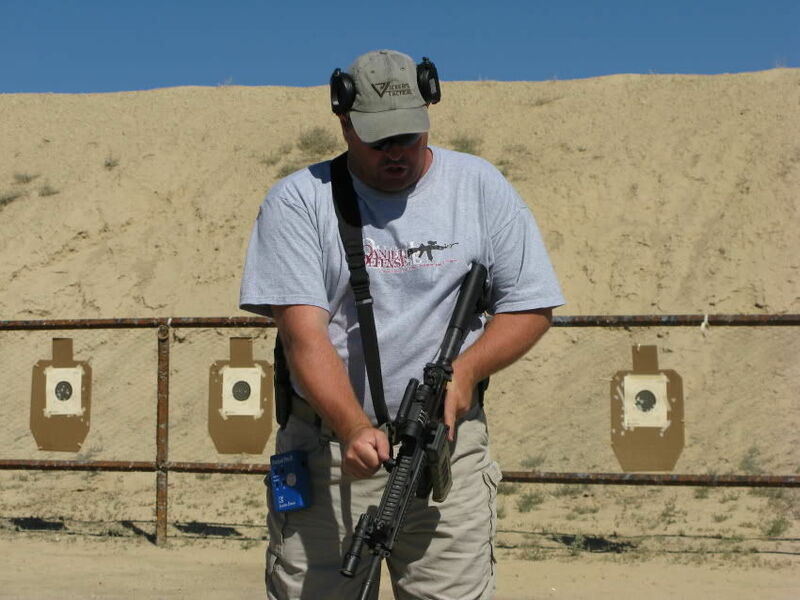 The single point sling is not nearly as restrictive as a 3 point sling, it didn't get hung up on my gear, no straps to get in the way of the controls of the AR15 platform, easy to transition from one shoulder to the other, etc. Like everything in life, nothing is free and I found out that there is a price to pay for this freedom of movement. 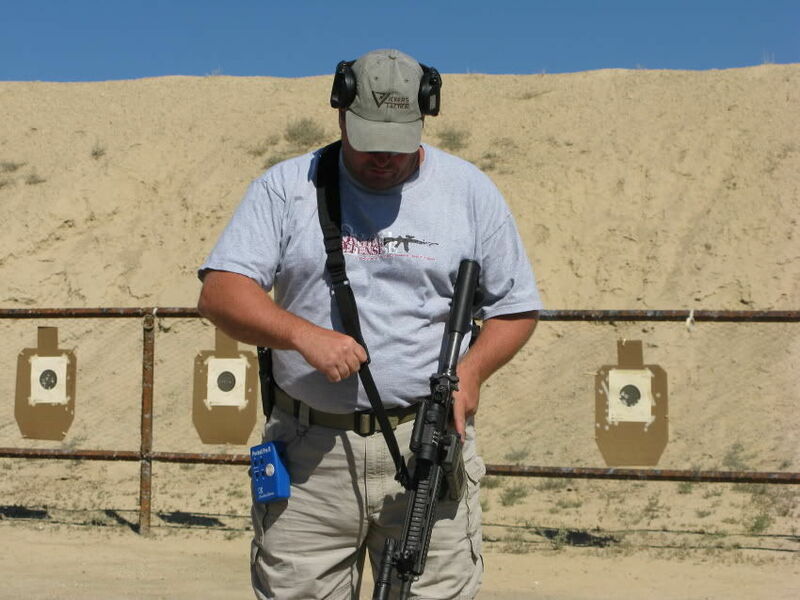 While the carbine is in your hands, there is nothing restricting movement with the single point sling. When the carbine is in the slung position the gun just dangles. When you trainsition to pistol and drop the rifle it often hits one of your knee caps. When on SWAT calls, sometimes I'll be carrying something and have to let the gun hang, as I walk the barrel hits my knees or shins as I walk. A single point sling, unlike a 3 point sling, doesn't do a good job at retaining the gun. When kneeling, with the 3 point sling, I would just rotate the gun around my body to my left rear hip, as I knelt down, the gun would move with me. If I do this with a single point sling there is nothing keeping the gun from rotating (ie. the muzzle wants rotate toward the ground) and the muzzle often goes in the dirt. Another thing that annoys me about the single point sling in the down position is if you let the gun drop (ie. tranistioning to pistol) often times the gun will swing back and forth, not only does the barrel hit your knees, I have had the stock hit me in the face (usually the chin or jaw). 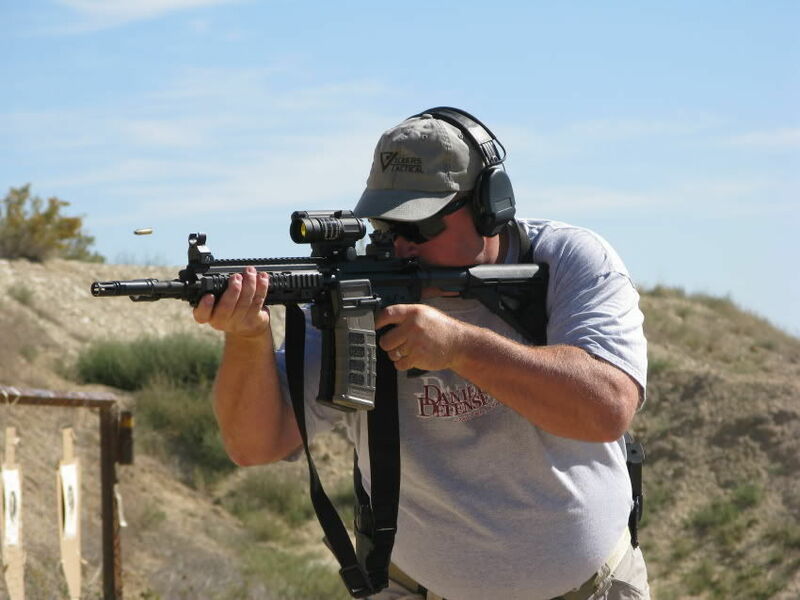 2 point sling: I used a 2 point sling in the early 90's as a USMC Infantry Marine, it was not the most comfortable thing, but it was better than holding the gun in your hand for long periods. This type of sling was a carry strap and not what we would consinder a tactical sling. Since early 2006 I have been using an quick adjust 2 point tactical sling. The quick adjust 2 point sling (like the Blue Force Gear VCAS 2 point sling and theViking Tactics VTAC 2 point sling) have all of the pros of both of the single and 3 point sling, with none of the shortcomings. The thing I like about the modern 2 point slings (like the Blue Force Gear VCAS and the Viking Tactics VTAC 2 point sling) is the ability of placement on the gun. With a 3 point sling the front attachment is in the area of the front sight post and the rear attachment is on the rear of the stock. The Single Point sling is a loop that attaches at a single point, most common attachment point was the location where the buffer tube meets up with the lower receiver. With the 2 point sling you can use several different location points. For the front attachment if you have a railed handguard like a LaRue you can place the front from as far forward as the front sight post or as far back as the delta ring or anywhere in between. With the rear attachment you can use either a Single Point Sling Plate and have the rear attachment point where the buffer tube meets up with the lower receiver or can attach it to the buttstock. I perfer the front attachment near the delta ring (the location where the LaRue rails have the quick release attachment hole) and the rear attachment on the rear of the buttstock. The things I like about the modern quick adjust 2 point sling, when the carbine is in your hands, you have almost the same freedom of movement of the single point sling. There are no extra straps to get in the way, the 2 point sling doesn't get hung up on gear, etc. In the slung postion the gun lies diagonally across your body. This makes walking easier, the carbine doesn't hit the shooter when he transitions to pistol. If performing tasks with your hands you can move the gun to your back and it retains well simular to a 3 point sling. The adjustment on the VCAS and VTAC slings are very quick and easy to use and the sling can be adjusted with one hand. 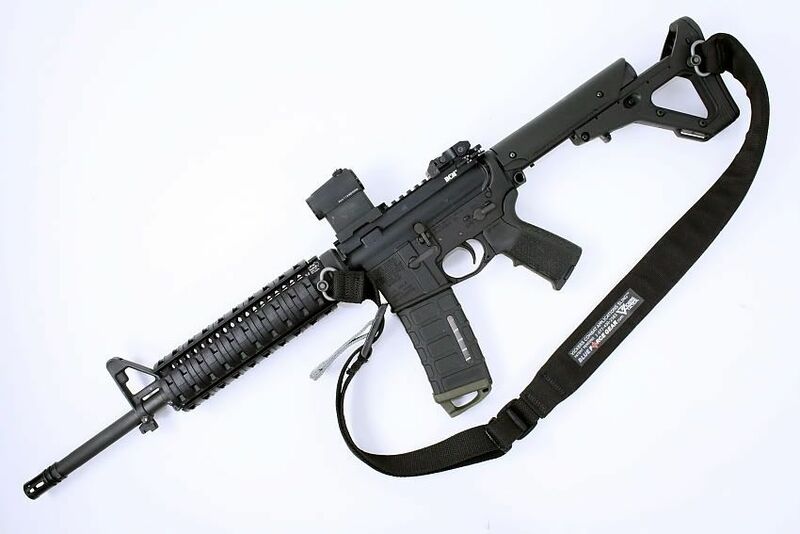 This lets the shooter have as much slack in the sling or retention as he needs. I was talking to Ashley Burnsed at Blue Force Gear last year about something unrelated and he asked what I thought of a padded version of his VCAS sling. At the time I told him it was unneeded. A few months ago I tried one and I didn't know what I didn't know. I was so impressed with the padded version that I'm in the process of changing ALL of my VCAS slings over to the padded version. The padded portion of the sling won't chaff exposed skin, it slides over gear more easily (not that I ever had a problem with the standard VCAS, but the padded version slides over gear more easliy), no buckles on the portion of the sling that goes over your shoulder and around your back, etc. Both the padded and un-padded VCAS slings are awesome, but for me after trying both, I much prefer the padded version. Sling choice like everything else in life is personal preference. Find the gear that works best for you and your mission.